Part of the problem may be that McConnell is focused on his 2014 reelection bid. Actress Ashley Judd is still only considering a run against McConnell, but he’s concerned enough that he’s already doing polling to identify her weaknesses. 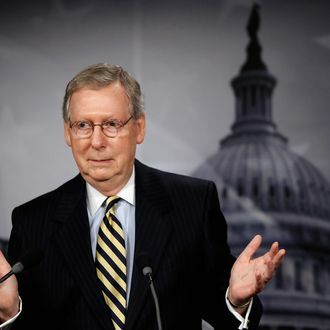 Being hailed as the man who saved America from the fiscal cliff doesn’t sound so bad, but it could make trouble for McConnell back home in Kentucky. The Club for Growth has vowed to oppose any compromise that includes a tax hike, and if the group gets behind a primary challenger, McConnell could lose before he even gets a chance to use his dirt on Judd.